Flavia reminded me of myself at her age (not that I knew as much as her, but I was a precocious science whiz with a sense of adventure). I loved this book, with its combination of light-hearted wit, imaginative storyline, and memorable characters and interrelationships. 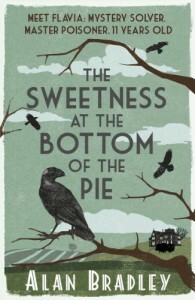 There is a dark side to some of the writing and relationships (Flavia's unhealthy interest in poisons and her filial quarrels with her sisters) that gives the story a satisfyingly realistic aspect, even though the outlandish plot is clearly in the 'entertainment' category of detective fiction (a good thing, as I presume the novel is aimed at "Young Adults"). There are some thought-provoking and challenging discussion points at the back for school or book club readers.